La mappa mostra i risultati della ricerca sotto forma di cerchi, ordinati per le principali caratteristiche delle società. E' possibile modificare i criteri di ordinamento cliccando sull'icona a fianco degli assi X e Y.
Migliaia di prodotti mondiali accessibili da un solo conto, 26 mercati mondiali in tempo reale e 3 piattaforme multifunzione a tua disposizione. 10 trades without commission and PowerDesk free of charge for one year. Join Fineco global trading now. Advertising message for promotional purposes. To view all the terms and conditions for the advertised services, please refer to the information sheets and documentation required under current regulations. All services require the client to open a Fineco current account. 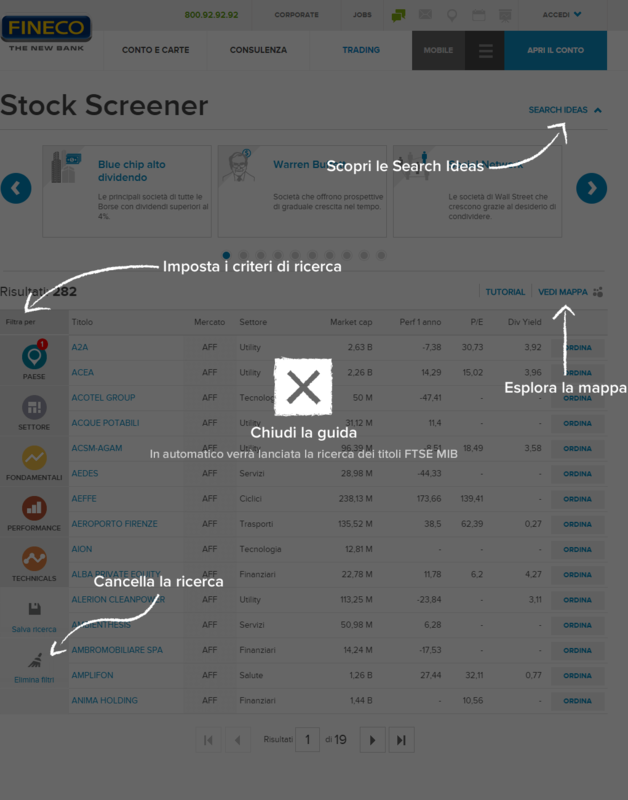 Stock Screener: new search engine. Search Ideas are packages of pre-composed filters which offer a selection of shares responding to predefined parameters, highlighted in every search. The parameters used and their value represent thematic search criteria developed by WebSim, the retail division of Intermonte SIM. The data is provided or processed by Reuters based on third-party analyses. The information and data displayed and/or generated by the visualization and analysis tools are for information purposes only and do not in any way represent an investment advice service nor a public offer of financial instruments. The operational decisions that follow are therefore to be considered taken by the customer fully independently and at his own risk. FinecoBank S.p.A, Reuters and WebSim are not and shall not be liable with regard to the method of use of such data and information.